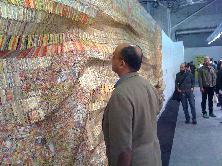 My favorite contemporary work in the 2009 Armory show was this piece by the Ghanaian-born, Kumasi-educated, Nigerian-based artist El Anatsui. There are two works in the same style you can view at the New York Met: one in the African collection, Between Earth and Heaven, and one in the contemporary collection, Dusasa II, which is included in this webpage of an interview with him. 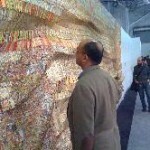 The picture shows it installed at the 2007 Venice Biennale.